YES, the Urban Farm and Garden Tour is happening today, Saturday September 13 from 8 a.m. to noon! Please see the main page for the list of thirteen sites, addresses and map. Pick up a brochure at your first stop to make sure you have the addresses of the home gardens, as they are not published online. Tuesday September 2, 11:30 am – 12:30 p.m., Whiskey Cake, 1845 NW Expressway. $5 ticket includes ser ving of whiskey cake. Kurt Reiger, President of Smart Pot, a locally owned and operated Oklahoma City business, presents a lunch-and-learn class on the national movement of container-growing vegetables. Smart Pot gardening containers provide an excellent balance of water retention, drainage and breathability — perfect for vegetables. Come early (doors open at 11:00 a.m.) to order lunch from Whiskey Cake’s locally-sourced menu! Call 405-582-2253 to register. Tuesday September 2, 7:00 – 8:00 p.m., Tickets $5 Plenty Mercantile Rooftop, 807 N. Broadway Ave.
Join Oklahoma’s own Jamie Csizmadia, Landscape Architect and Owner of Olthia Urban Prairie Garden Design, as she discusses the importance of native habitats adjacent to home edible gardens. Participants will learn why the presence of wild bees improves food production and see how to attract and keep beneficial pollinators, including the best indigenous plants for the job. 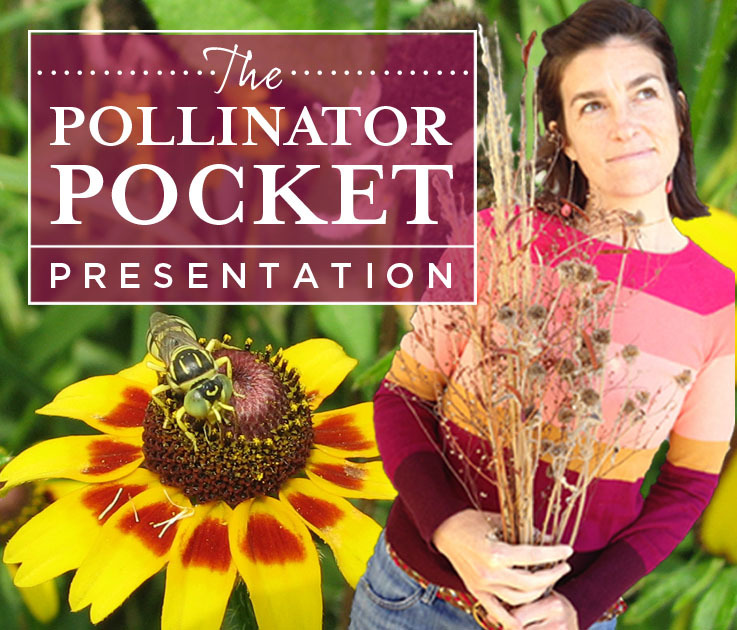 Attendees will take home a classic layout for a front yard Pollinator Pocket + Edible Garden design, geared towards the typical OKC residential lot. Nationally acclaimed author and radio host Howard Garrett, aka The Dirt Doctor, presents his recommendations for organic methods for landscaping and backyard gardens. Book signing and free reception sponsored by Smart Pot to follow. Nationally acclaimed author and radio host Howard Garrett, aka The Dirt Doctor, discusses the benefits and methods for growing a bounty of food in the fall in Oklahoma. A tree planting demonstration will be included. Attendees will receive Howard’s Basic Organic Program Handout and will have a chance to win books and natural organic products. Growing Cities is a brand-new documentary which examines the role of urban farming in America and asks how much power it has to revitalize our cities and change where we grow food and the way we eat. Special free reception sponsored by Kam’s Kookery and Guilford Gardens to follow. Learn about the landmark ordinance adopted in 2014, which supports and encourages composting, rainwater harvesting, and other activities on a variety of garden types. Find out how this could benefit existing urban agriculture efforts in Oklahoma City and share ideas for a future community garden program. Please RSVP by calling 405-297-3692 or e-mailing madeleine.wiens@okc.gov. Discover an easier way to garden in this free workshop at Whole Foods Oklahoma City. A range of nutritious greens and vegetables can be grown in our climate through the fall and even the winter – with less watering, weeding, and work. Register at www.eventbrite.com. Saturday September 6, 8:00 a.m. – 12:00 p.m., RESCHEDULED DUE TO RAIN for Saturday September 13, 8 a.m. to 12:00 p.m. Tickets $5 available the day of the tour at select tour locations by cash or check; advance tickets available at Whiskey Cake at 1845 NW Expressway. Discover the beautiful array of edible landscapes, urban farms, and community, school and home gardens thriving here in Oklahoma City in this informative and inspirational self-guided tour. You can also volunteer for the tour here. A workshop to help pull back our view of the city and see it situated in the natural world. Participants will begin to get reacquainted with our bioregion, deepen our sense of place by visiting several sites, exploring our natural history and mapping our “home.” Pat Hoerth, of Turtle Rock Farm Retreat Center, will lead the workshop. Contact localfoodokc@gmail.com with ideas, questions or requests!